Liturgical requirements dictated that every church and chapel should have an altar. The desirability of furnishing the altars with altarpieces had been recognised as early as the 11th century. An altarpiece emphasised the sacred quality of the space in which it was placed and illustrated the readings of the celebrant (the priest officiating at the Catholic service of Mass) in front of the altar. The Swansea Altarpiece was made in the second half of the 15th century. By this time there was a long tradition in England and elsewhere of producing altarpieces with scenes from the Life of Christ and the Virgin Mary. Alabaster - a form of gypsum - is a comparatively soft material and is therefore easy to carve. It can also be polished. Its natural colour was especially useful for the representation of faces and flesh, which would normally remain unpainted. The finished alabaster panels in altarpieces of this type were fixed into position in the wooden frame by means of lead wires. They were embedded in the backs of the panels, fed through holes in the frame and secured. Altarpiece, alabaster panels in a painted framework of oak. The panels illustrate the Joys of the Virgin, comprising (from the left) the Annunciation, the Adoration of the Magi, the Ascension and the Assumption/ Coronation of the Virgin; at the centre is a taller relief of the Trinity and at the ends single figures of St John the Baptist and St John the Evangelist. The Swansea Altarpiece, so-called because it formerly belonged to Lord Swansea's collection at Singleton Abbey, Swansea, is a rare complete example of a genre once widely represented in Britain. Victoria and Albert Museum's collection of over 260 English medieval alabasters - by far the largest in the world - is overwhelmingly the result of Dr W.L. Hildburgh's great beneficence in this area: he gave his entire collection to the Museum in 1946. The subject matter of the altarpiece is primarily concerned with the Joys of the Virgin, comprising (from the left) the Annunciation, the Adoration of the Magi, the Ascension and the Assumption/ Coronation of the Virgin; at the centre is a taller relief of the Trinity and at the ends single figures of St John the Baptist and St John the Evangelist. Paul Williamson, ed., European Sculpture at the Victoria and Albert Museum, London : V&A, 1996. p. 65, ill. ISBN: 1 85177 188 3. 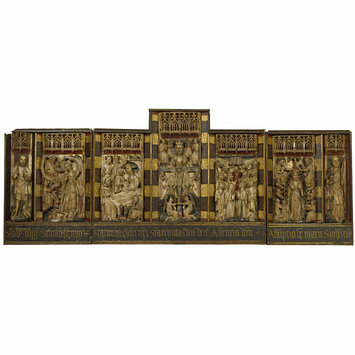 The Swansea Altarpiece, alabaster panels in a painted framework of oak, English, second half of the 15th century. Maclagan, Eric. An English alabaster alterpiece in the Victoria and Albert Museum. The Burlington Magazine for Connoisseurs. 36. 1920. pp. 53-65. Trusted, Majorie. ed. The Making of Sculpture: the Materials and Techniques of European Sculpture. London: V&A Publications, 2007. p. 108. pl. 187. Alabaster altarpieces were made in large numbers, for English churches and private chapels, but also for export throughout Europe. This one shows the Trinity flanked by scenes know as the Joys of the Virgin. At the ends are St John the Baptist and St John the Evangelist.